Some families spend their leisure time together relaxing on the beach or meandering across the golf course. In my family, group recreation is most often in the form of a construction or clean-up project, soundtracked not by lapping waves or the shout of “Fore!,” but by the loud rumble of a diesel engine. Hidden within that grassy mess is a 1950s David Bradley hay rake, which when I bought the farm was stashed along the woodline, covered in vines and honeysuckle. One of my closest encouters with it was during my first summer at the farm, when I was crawling around in the woods trying to retrieve errant guineas, and I looked up to see a massive snake stretched out along the warm metal, sunning itself. After that I stayed far away. 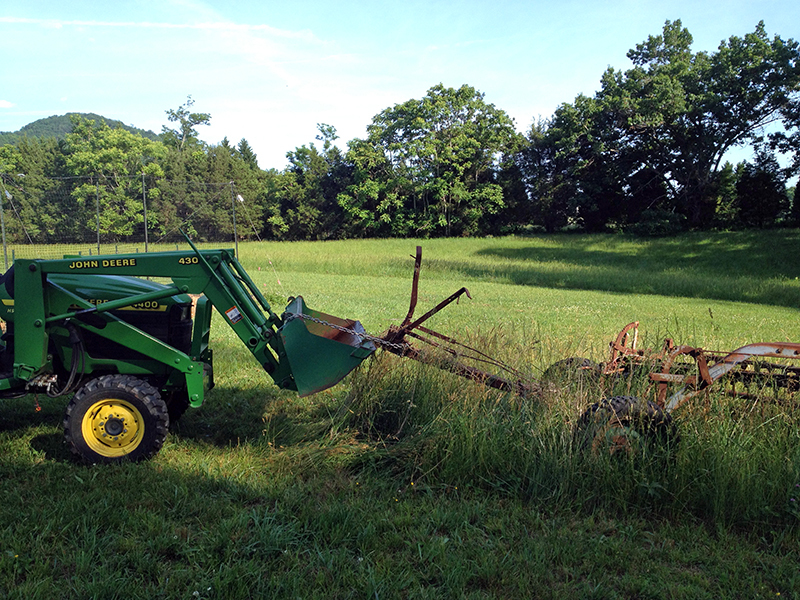 Two winters ago, when my friend Steve and my dad and I cleared the woodline of invasive trees and brambles and ripped out the old pasture fence, we dragged the hay rake out of the woods and dropped it in the field. Where it sat, all last spring, summer, fall, winter, and spring again. I posted it to CraigsList, but unfortunately it was in such poor shape—totally rusted through in spots—that I didn’t get any takers. 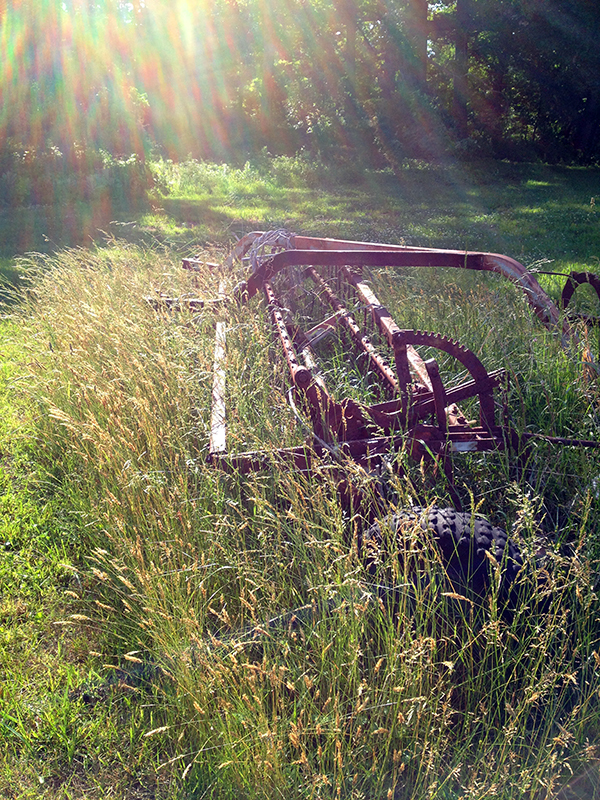 I hated mowing around it, and hated how it looked like a big piece of rusted junk in the middle of my otherwise well-kept field. Which, it was, arty sunset shots notwithstanding. Well finally last Saturday night my dad hooked the green tractor to the hay rake and took it for its final ride across these fields. Of course, the rubber tires were rotted off so it was more of a drag than a ride. 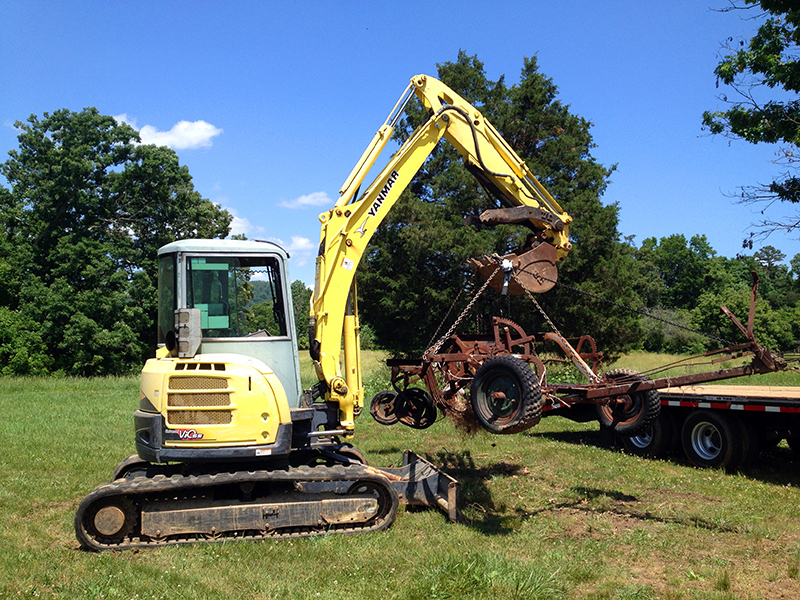 Then Dad staged up an empty trailer and returned the next morning with Mom and the excavator. It took a few tries to get all the chains positioned so that the rake would balance when lifted in the air, but eventually Dad got the perfect pick. 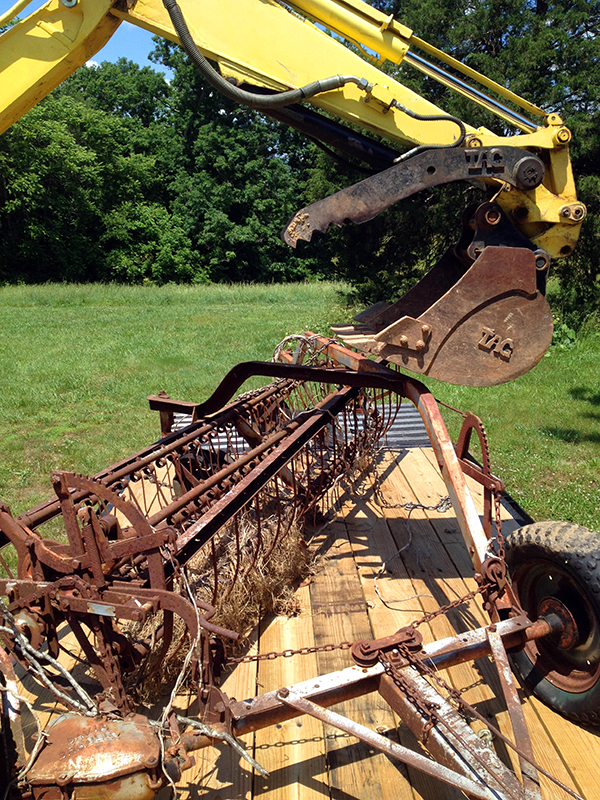 Then Mom and I got on ropes on either side of the rake to direct it as Dad lowered it on the bed of the trailer. We got it set down just perfectly within the confines of the eight-foot trailer bed. Then Dad chained it down and drove the whole rig off the farm to the recycling center. 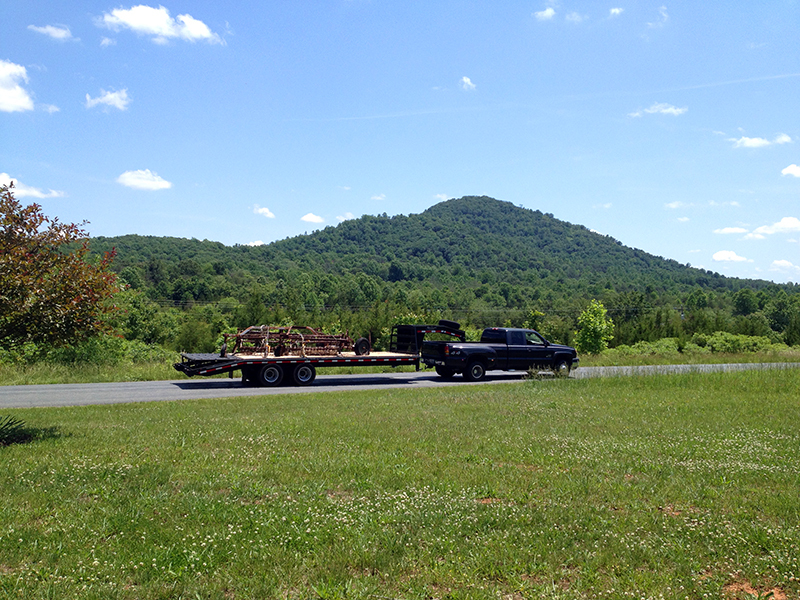 I was ecstatic to see it go—I had wanted this off the property ever since I bought this place five years ago! With every bit of clean-up we do, we’re reclaiming this piece of land which, though incredibly beautiful, was neglected and in some ways abused before I got here. Putting all this positive work, energy and intention into this property is nurturing it so that it can, in turn, take care of me. And I couldn’t do it without my awesome parents, so thank you both for all you do to help. There are no two people in the world who I’d rather stand around with and breathe diesel fumes. Creeps up from the creek and across the field. 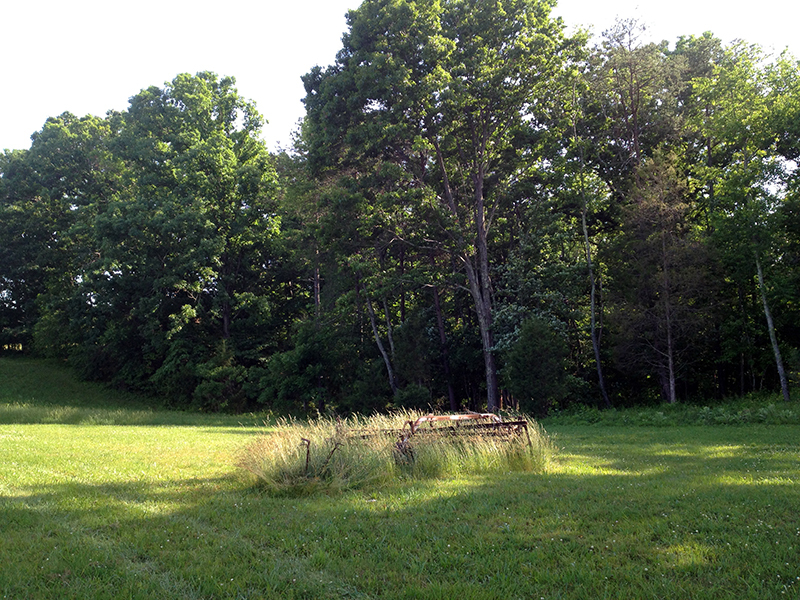 It’s been at least two years since I’ve bushogged the two sections of my property that I let grow wild. 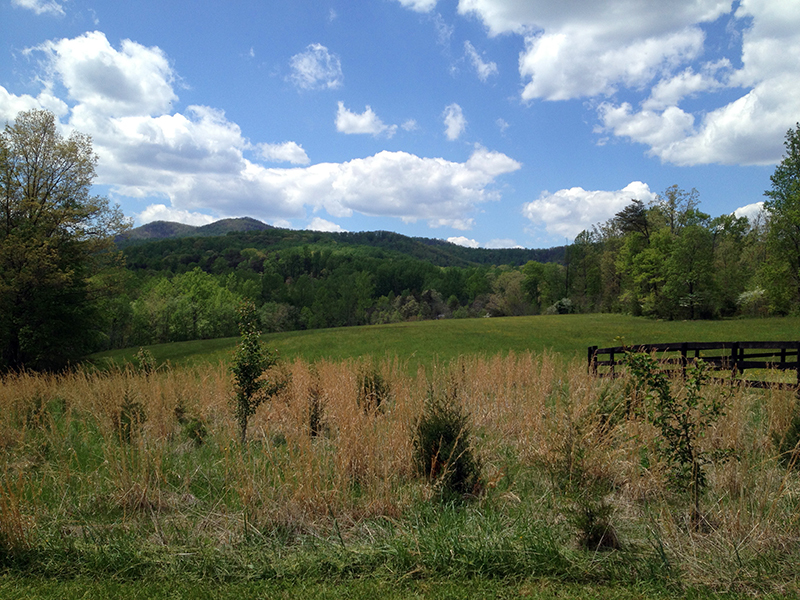 A neighbor used to cut hay off of these fields, but I decided I preferred to let the fields grow up and become better habitat for birds and little mammals. And, I love the color and texture of the dried broom straw, and how it interacts with light to provide an interesting middle ground in my photographs. But landscape succession is an inescapable rule of nature, and in this part of the world open fields want to return to hardwood forest. 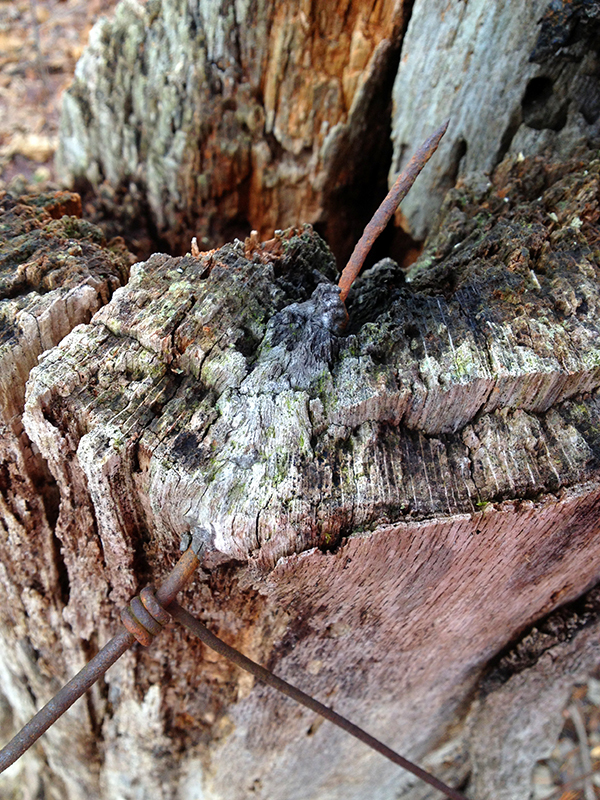 The first pioneers are the brambles, and then come woodier plants such as native Eastern Red Cedars, sown by birds. There’s also some woody plant in the mix that resembles a quince in leaf shape and thorn, but doesn’t appear to flower. 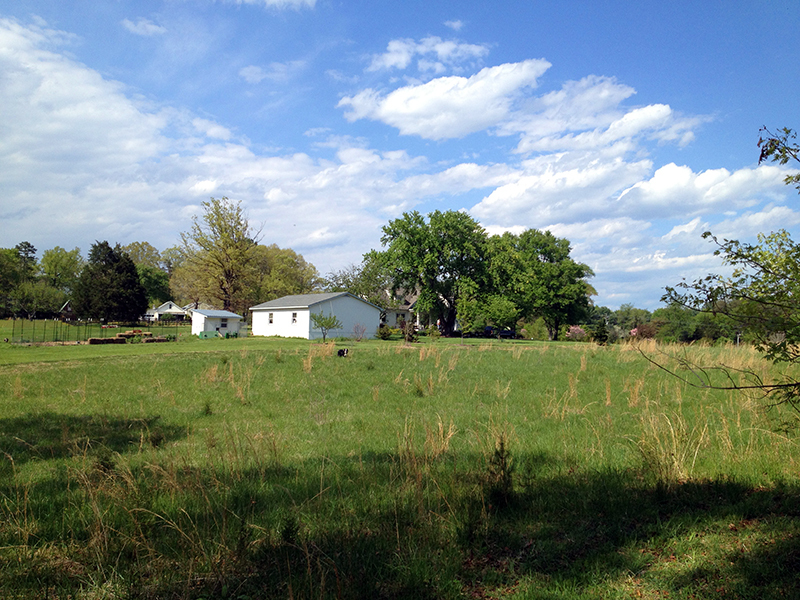 Without mowing, an open field will become an impenetrable thicket in just a few years. It’s a beautiful and fascinating natural process, but not one I want so close to home. Some day I may want to run livestock in these fields, and cutting out the woody growth while it’s still small beats trying to clear it when the plants are much larger and more established. So last weekend I spent the afternoon bushogging. 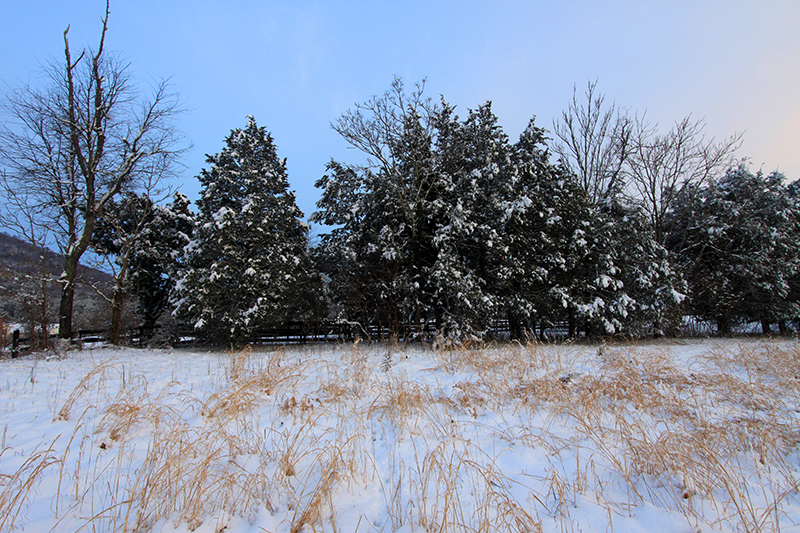 I left several of the small cedars standing in the back field, thinking they might turn into pretty pasture trees some day. They might also obscure my mountain view, so they may come out further down the road. If I didn’t want to preserve the view I’d let as many as possible grow to create a windbreak to protect the north side of the house from the crazy-strong winds that scream down this valley. 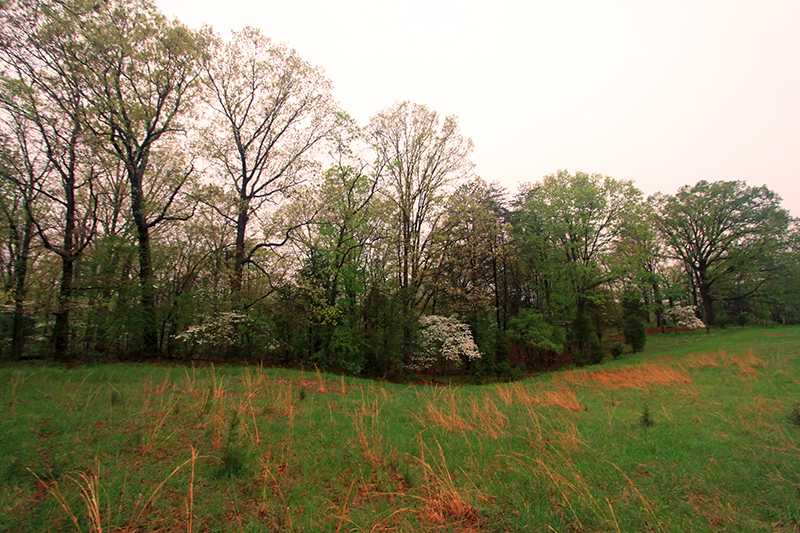 It’s interesting to me how much cutting these fields changes the landscape around the house. Although mown fields look neater and tidier, I prefer the added visual interest of the uncut fields. I guess the good thing is it’s just grass, and it will grow back soon. 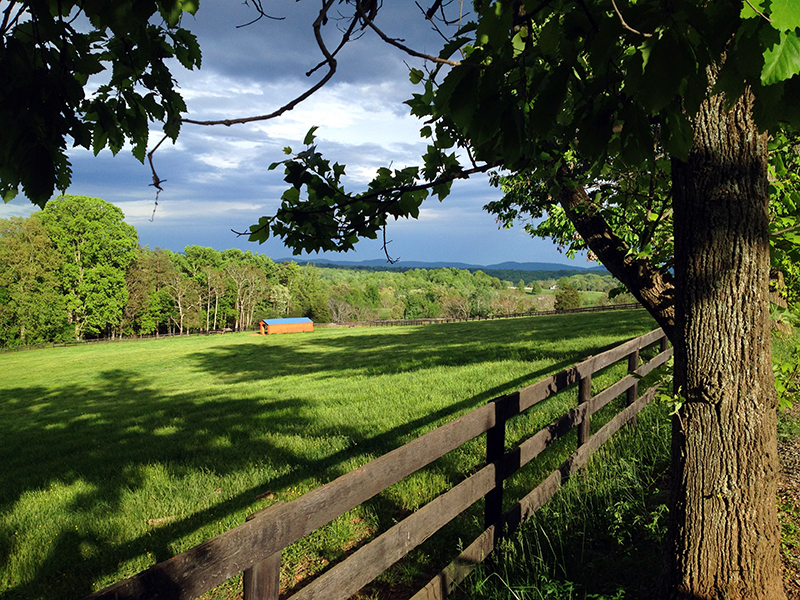 It’s rained for three days and nights, downpours and thunderstorms, and it feels as though this little pocket of central Virginia has become Seattle. The mists lift and drop, playing peek-a-boo with the mountains, and all the new spring greenery is positively glowing in the excess moisture. 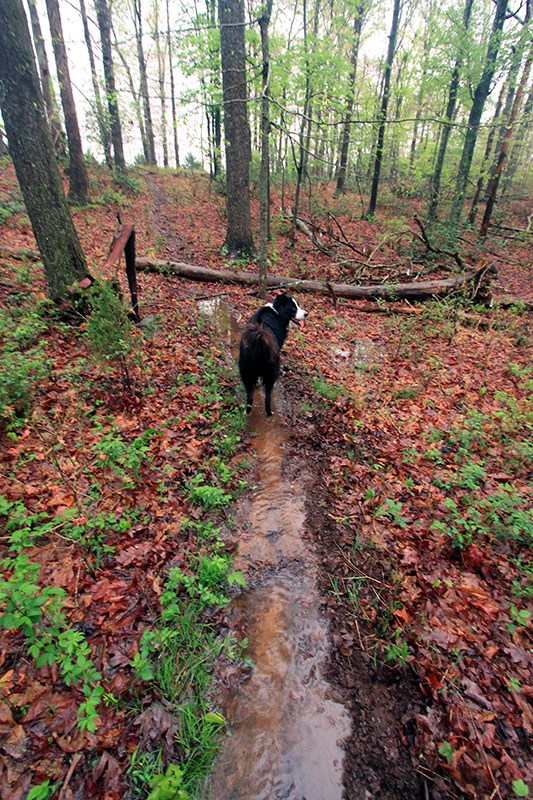 I took a short walk through the woods behind the house this evening, and discovered that Tucker’s trail has become, much to his delight, a creek. 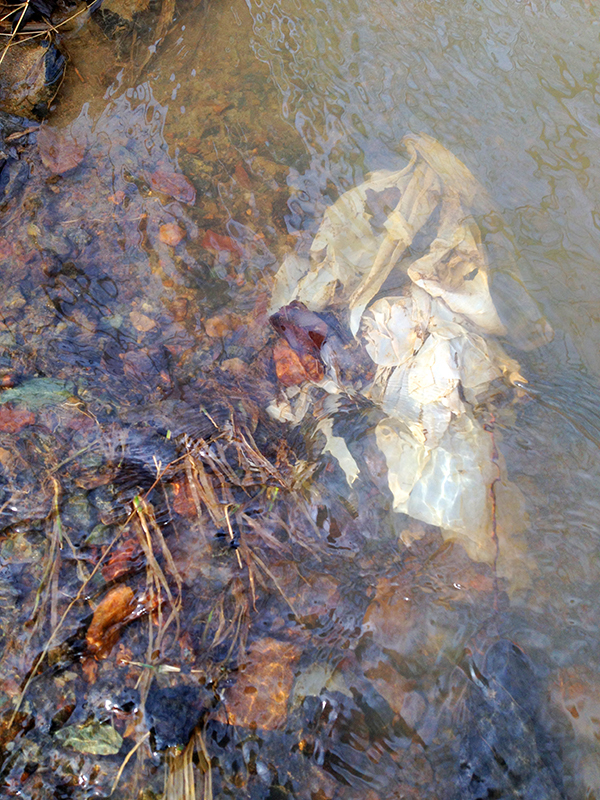 My Labrador in sheepdog’s clothing is thrilled that the stream has somehow migrated up the hill to within his reach. 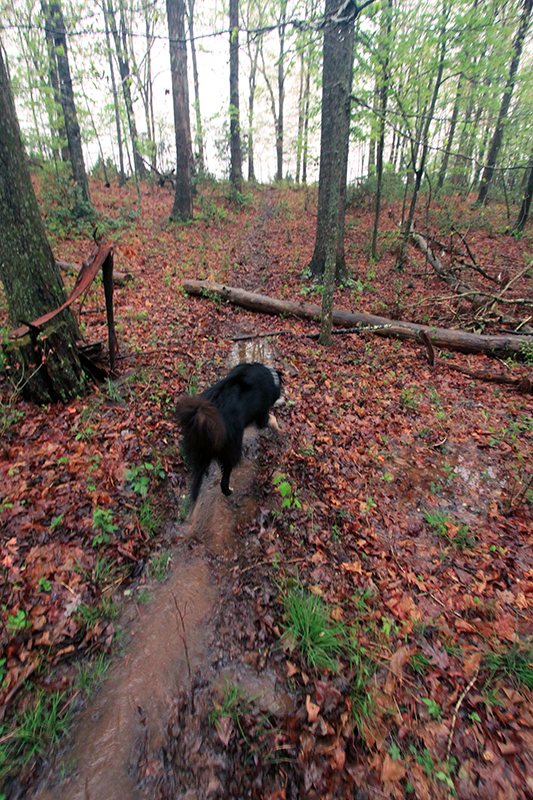 He zooms along it, mud flying everywhere. It’s so fun to watch his joy in the water that I can’t even be mad at how filthy he’s getting. 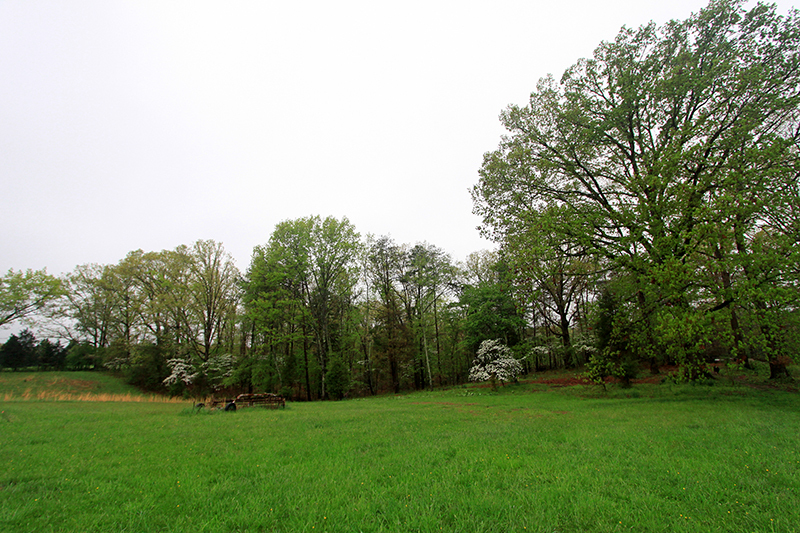 The woods are laced with our native dogwood, state tree of Virginia, and they look spectacular this year. It’s next to impossible to get a good shot of them in the woods, but in person they are stunning—ethereal white blossoms threaded through the entire forest. And look at that grass—technicolor! 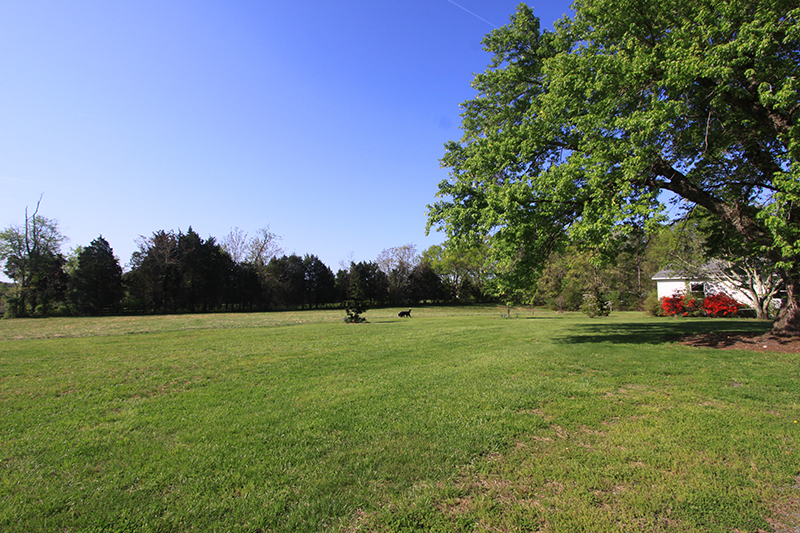 Methinks I will have the season’s first date with the mower this weekend, if the ground dries out enough to get on it with a big machine. 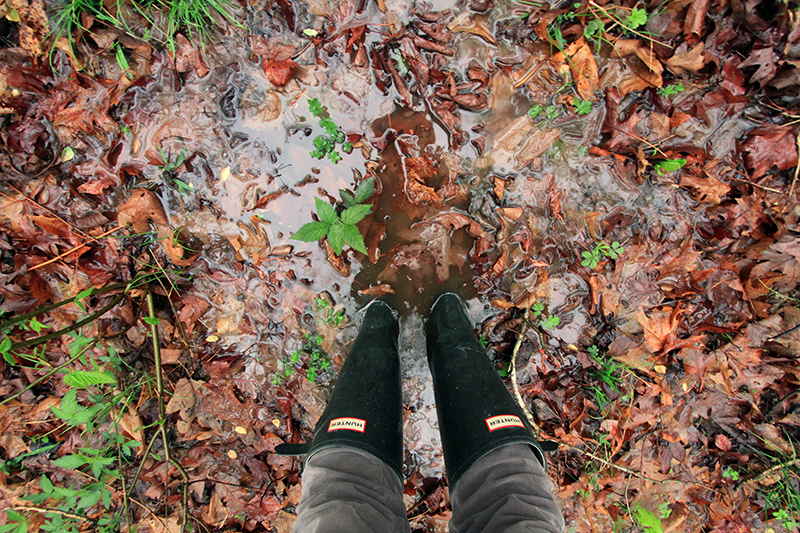 The middle of the woods, where it’s usually just dry forest duff, is now full of little ponds—this one deep enough to swallow my feet! I can’t understand why the water collects as it does here, instead of continuing to run down the hill to the creek. A mystery I’ll never solve. 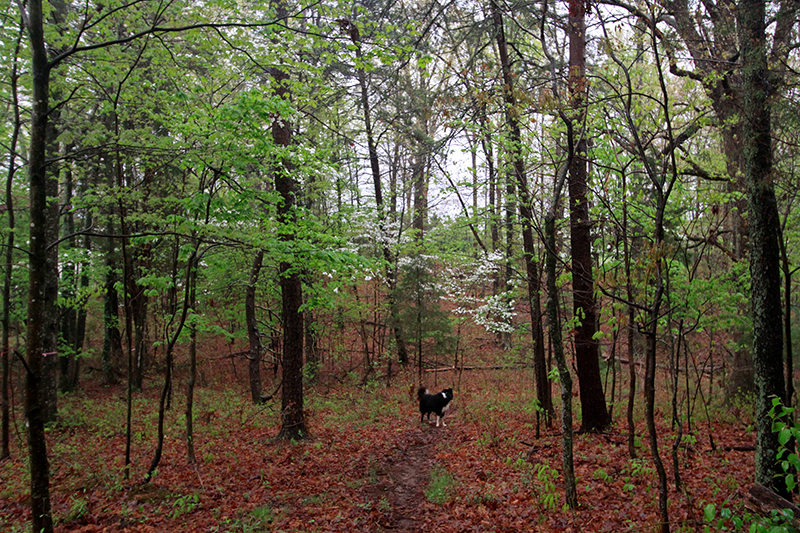 More dogwoods at the wood line, with the big oaks just leafing out above them. I love the gentle curves of this piece of ground. 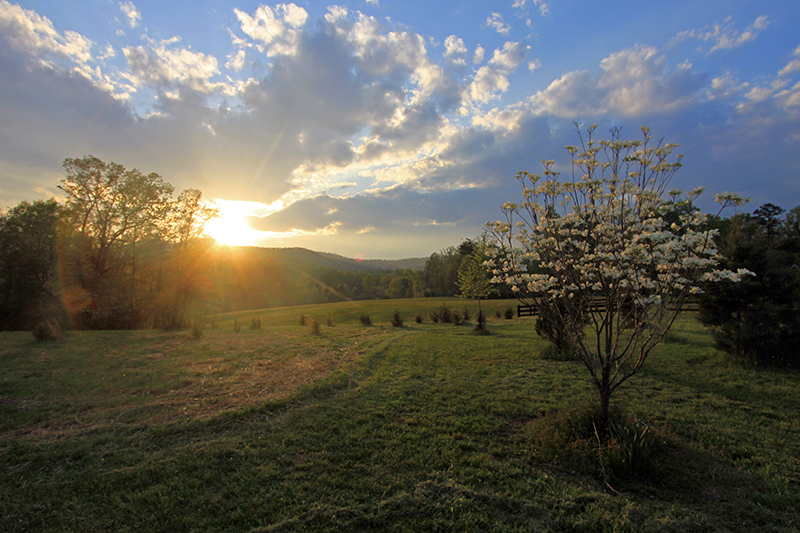 They remind me that I am lucky enough to live in the foothills of the Blue Ridge mountains. It started to clear yesterday evening around six, and what had been a socked-in, heavily snowing day turned into a stunning evening. Once again I was reminded of how the landscape around my house is so dynamic, its changes driven by the seasons, time, and weather. 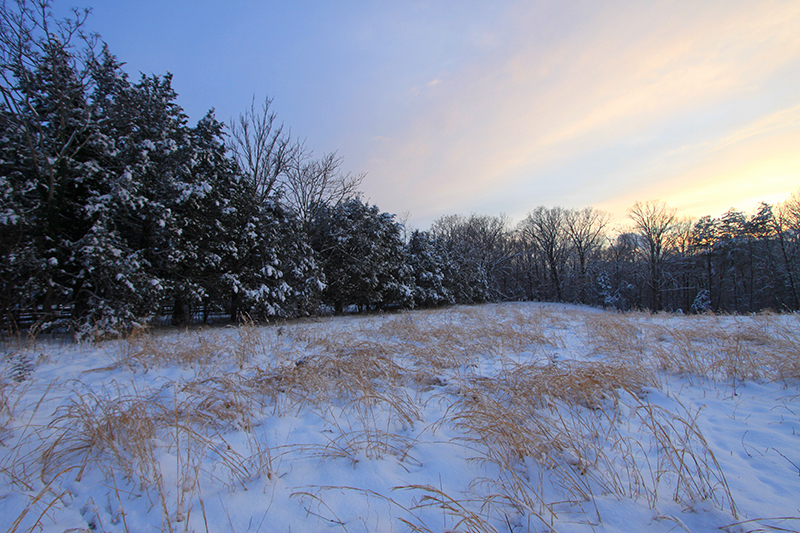 Mountains disappear and reappear, evergreens that usually fade into the background take center stage during a snowfall. Every tree limb is outlined and the horizon underscored. Under snow, previously unseen folds and valleys in the hills surrounding my house pop into relief and reveal unexpected topography. It was a beautiful night. 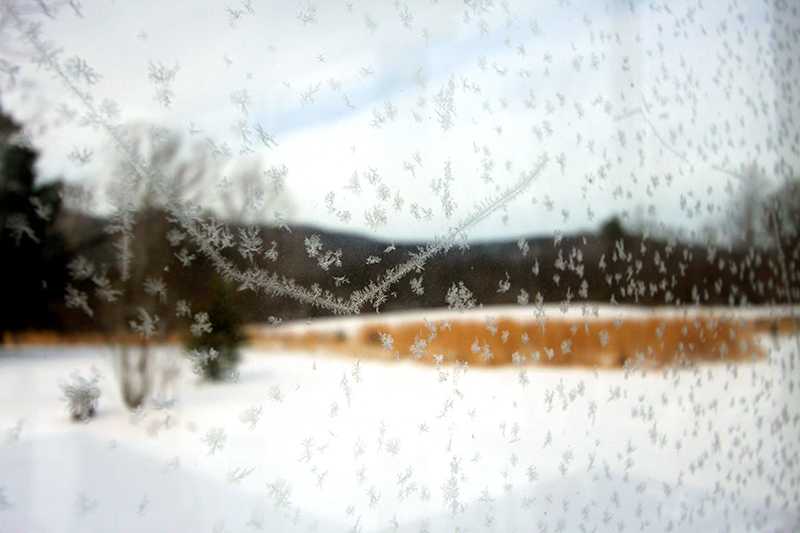 There is always something new to see, and if I don’t like the view out the window it will change in minutes. I am never bored. 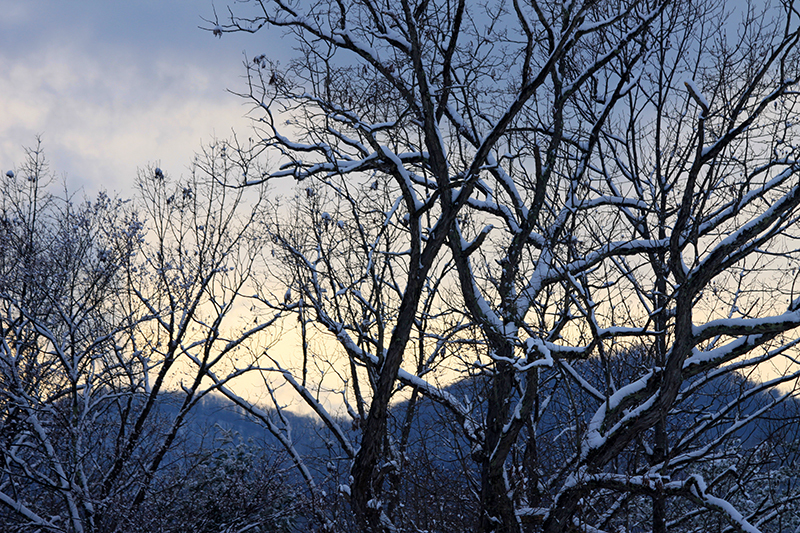 Just another zero-degree morning following a snowstorm. 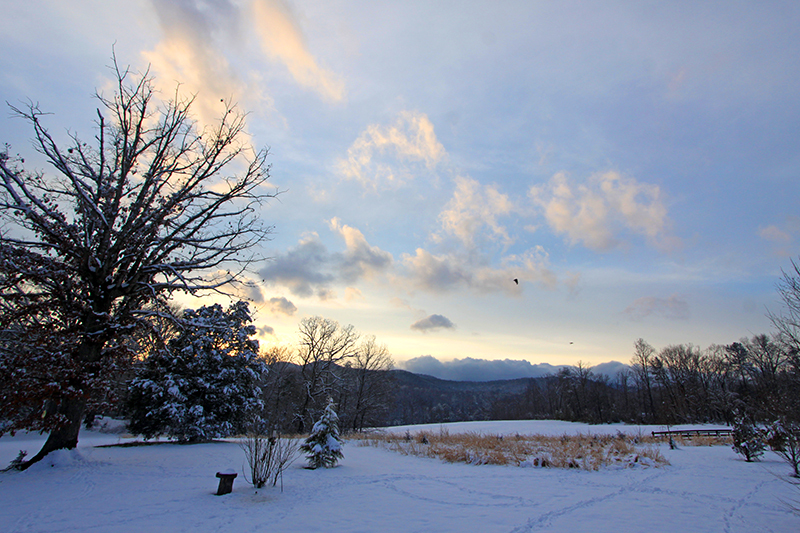 Refill the birdfeeders, defrost chicken waterer, tote in firewood, feed the wood stove, eat soup, make tea, rinse, repeat. 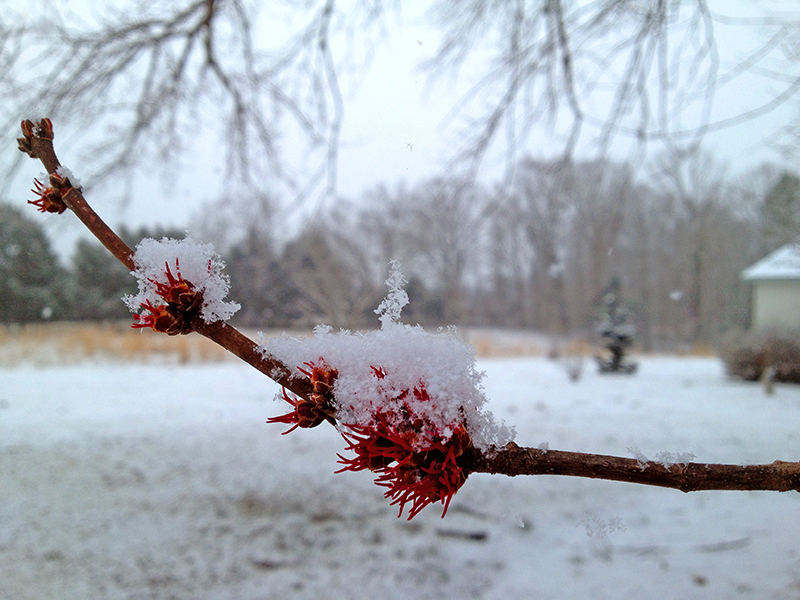 Just as I was going to write about how it was 65 degrees and sunny this past weekend, and that the maples are budding bright red, the winter weeds are blooming, and the male red-winged blackbirds have reappeared from their wintering grounds, another polar vortex dipped south. I’ve awoken to snow two mornings in a row. 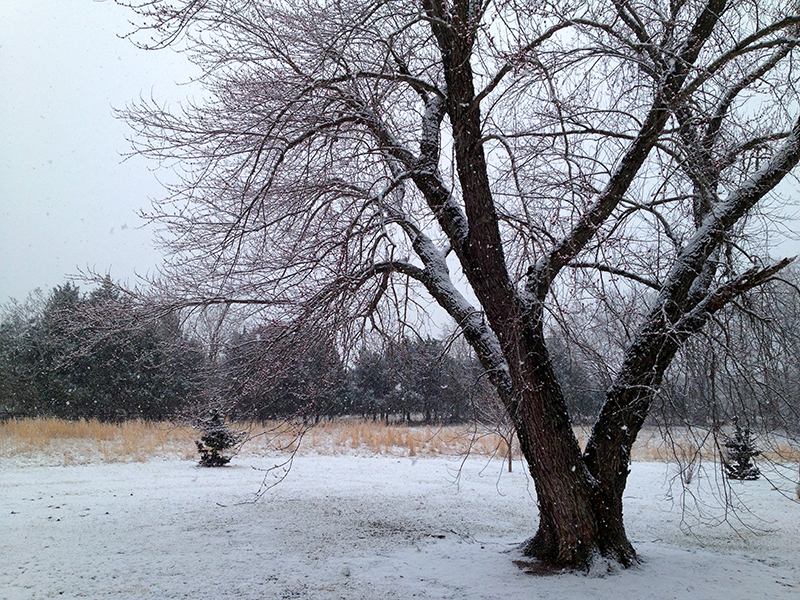 Not much accumulation is expected, but it’s enough to remind me that we’re still at least a month away from spring. When hours in front of the wood stove leave me feeling parched and sleepy, I like to take a walk to my nearest body of wild water. 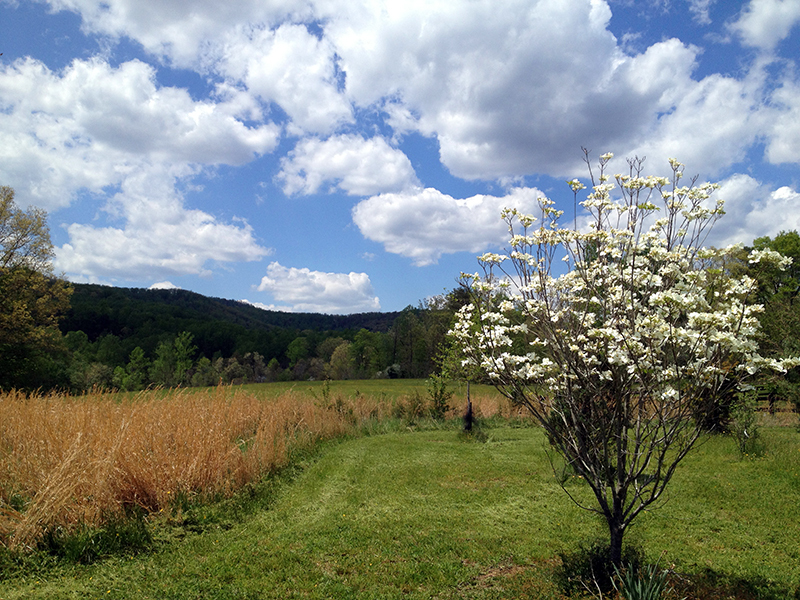 I head down the hill to the creek that runs along the back of my property. 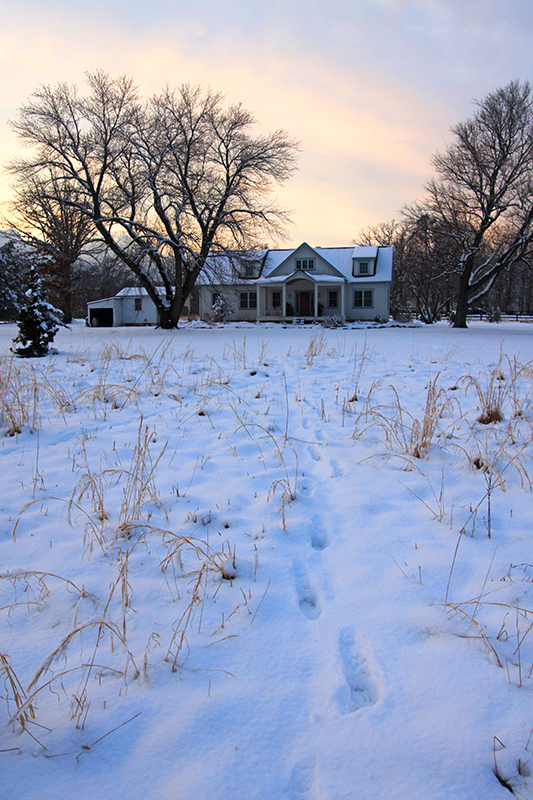 I have a relationship with this part of the farm only during winter. From March to about November the brambles grow so thickly that the woods are close to impenetrable, as well as being distressingly thick with ticks. 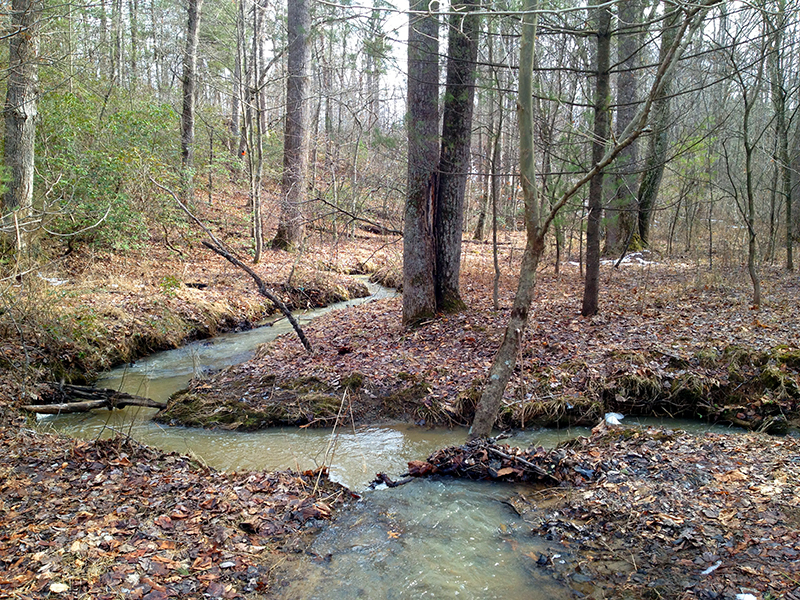 Walks to the creek in winter remind me of being a kid growing up playing in the woods and streams. 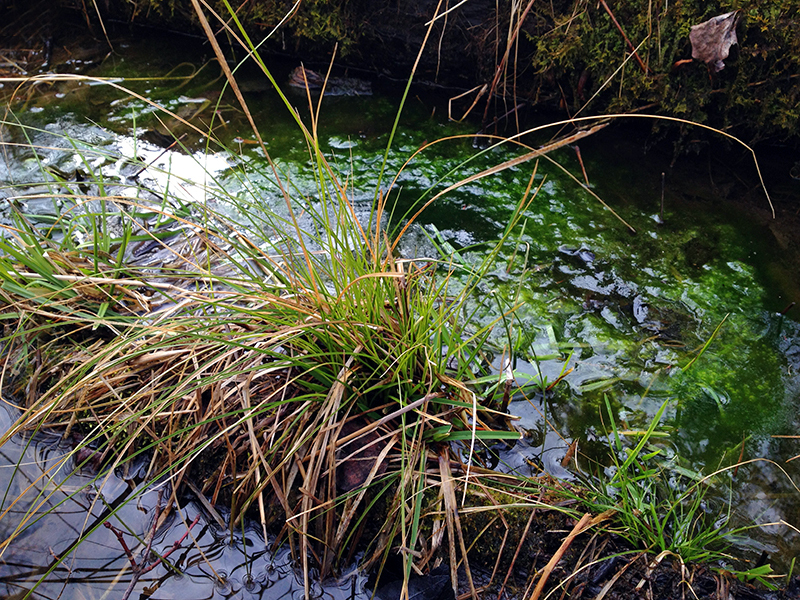 Today the mineral smell of standing water and boggy decomposition flung me right back to being ten years old and scooping gelatenous masses of polywog eggs out of still water. The clumps broke apart and slimed my hands as I dropped them into a bucket of water before toting the survivors home to hatch in a fish tank in the garage. 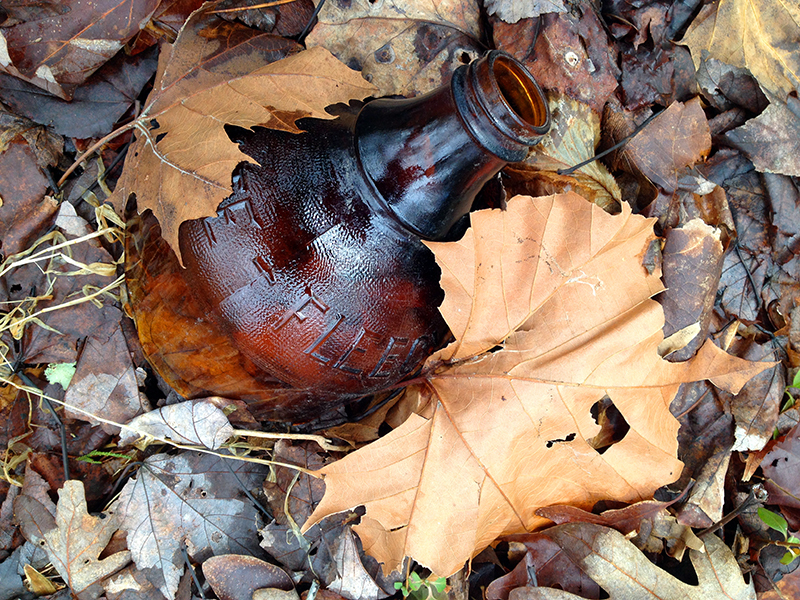 I always find some sort of treasure, usually old broken bottles, mostly of the hootch-holding variety. Today I found an amber jug with the words “white fleece” around its top. Nearby was the bottom of the bottle. I looked online but couldn’t trace the bottle’s provenance. The name make me think of fabric softener—but did that ever come packaged in amber jugs? A mystery for sure. The sound of the creek relaxes me—some day I’ve love to live near moving fresh water—and I like to walk up the creek in my wellies and feel the current against my feet and legs. Today the water was fast and churning grey from our recent snowmelt and rain. I have happy memories of the creek being the site of my first adventures with Tucker. When he was a tiny pup we’d walk down there, him absorbing the important lessons of following and staying close to me that have made him such an excellent off-leash trail dog. He’d stop and sniff stumps, memorizing the scents of the native foxes and beginning to understand his territorial responsibilities. I’d coax him up and over fallen trees—massive obstacles to legs just a few inches long—him gaining confidence and learning to trust that I wouldn’t hurt or put him in danger. Trips to the creek laid a good foundation for our partnership. 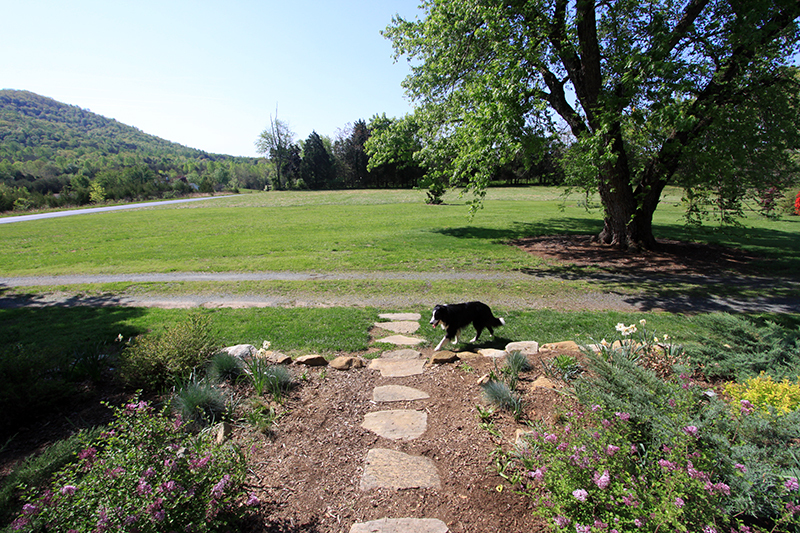 Eventually I restricted Tuck’s range to within sight of the homestead when I installed his invisible fence. He still has acres to patrol, but his winter visits to the creek are now just memories. 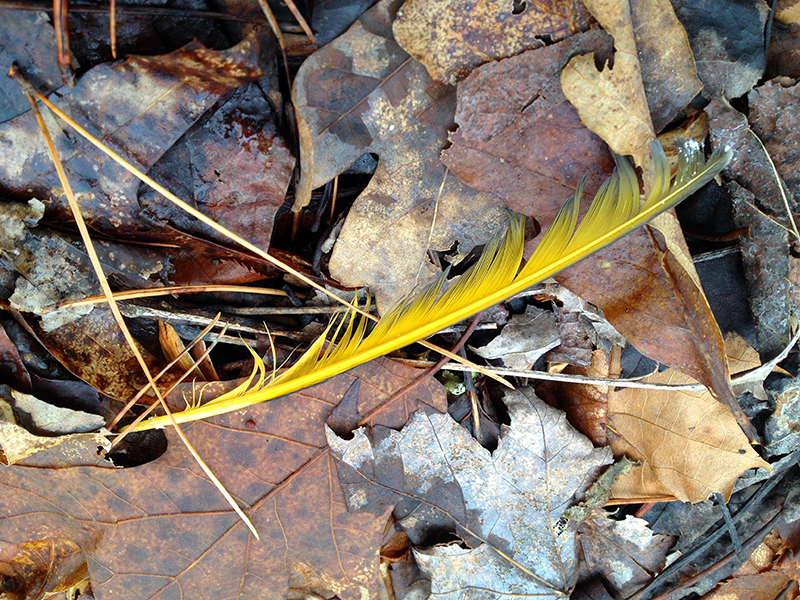 I spotted real treasure today with this small yellow feather. Despite being only about four inches long, against the brown leaves it stood out to me like a beacon. I tucked it into my pocket, to add to my collection, and once home identified it as a wing feather from a northern flicker. 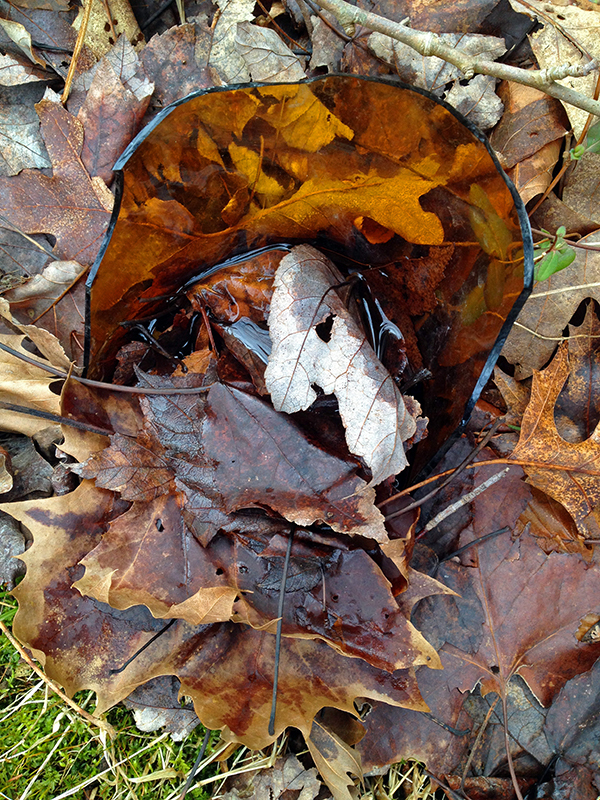 At some point I approached what I was sure was a horse-sized skull buried in the creek gravel. I got very excited, but turns out it was just a plastic bag. Seeing it brought to mind a hike I took up a creek in the Blue Ridge with friends the summer before I went to college. We got to a very tricky part that was basically just scrambling up a sheer rock face covered with rushing water. As I started to climb I slipped and fell backward into a pool of water, hitting my hip and injuring it for for what would turn out to be years to come. I was in great pain, but when I went to heave myself up I turned and saw that I’d splashed down right next to a dead dog, pale and decomposing in the water. 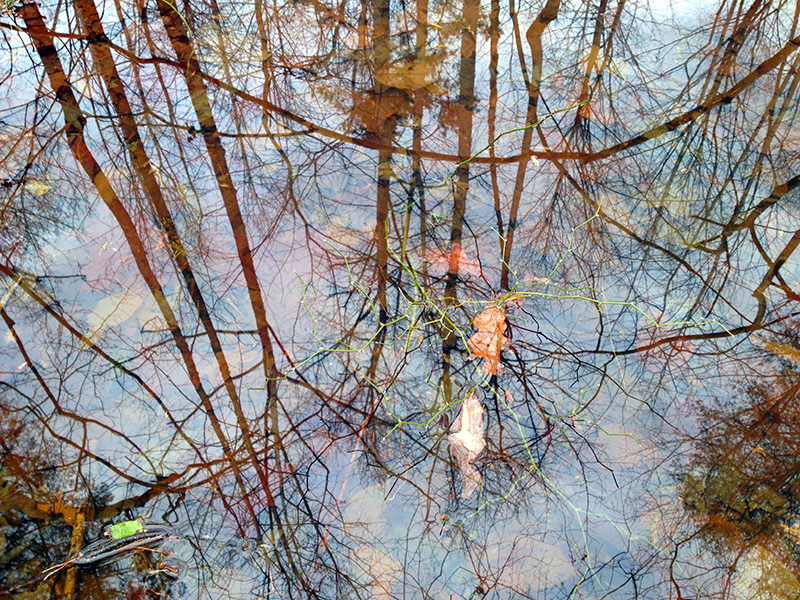 Maybe the winter colors of the creek really are all about death and decay. Regardless, or maybe because of this, I love this winter creek’s color palette best—when the water and leaves combine to give me new appreciation for a subtle layering of browns spiked with an occasional acid green, bone white or flicker gold. 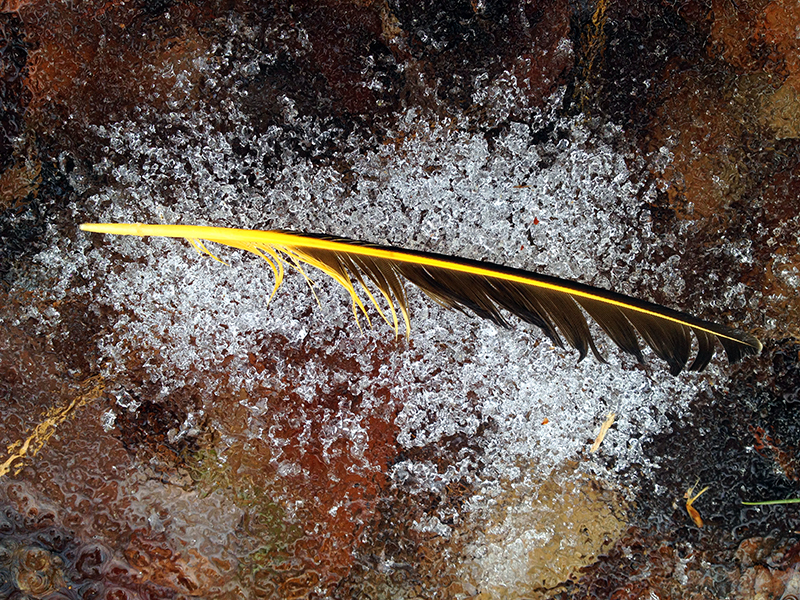 It takes work to seek out inspiration in winter, the season of sleeping rot, but each time I walk to the creek I find something beautiful. Around six tonight I suddenly remembered it was the eve of February’s full moon. 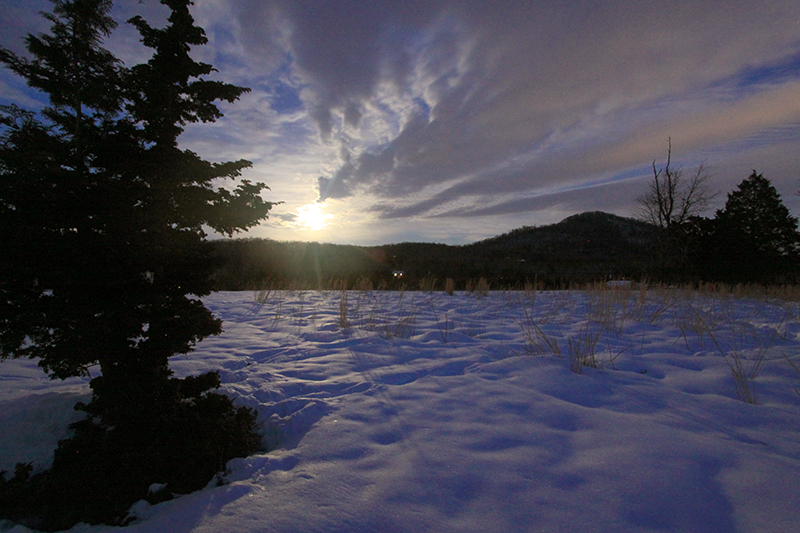 I ran outside with my camera and tripod to get a few shots as it rose in the front yard over Buck Mountain. 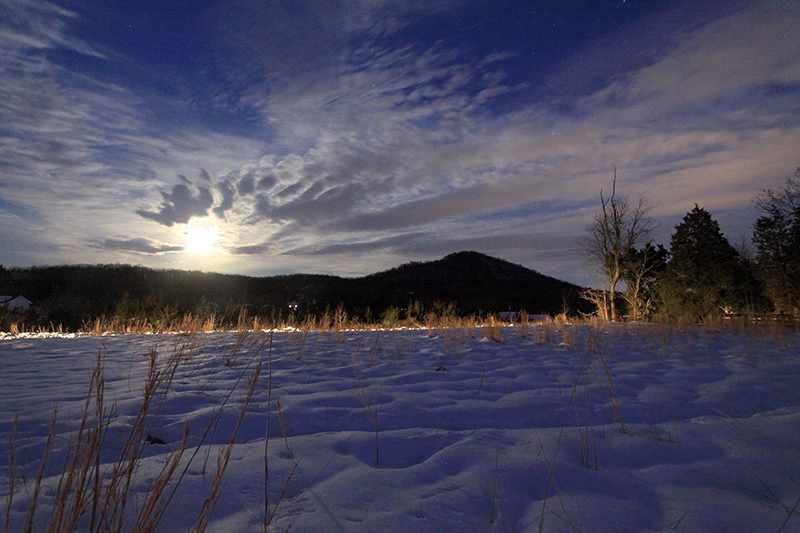 The moon’s light on all the snow made it so bright that within a few minutes of my eyes adjusting I could have walked anywhere I wished without any extra light. A far-away friend recently asked me if you could see any stars from my farm. Well, here’s your answer. Even on a full-moon night, the stars pop out of the sky. 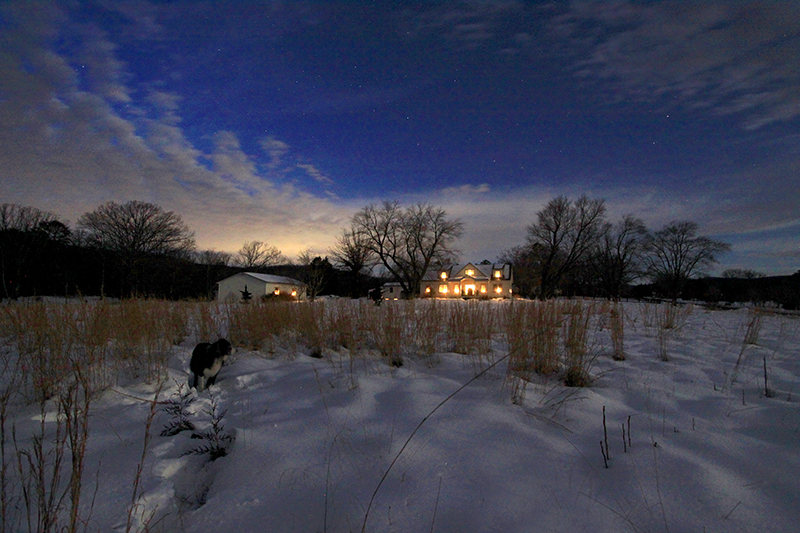 It’s nights like these that I’m again reminded why I like to leave the hay standing in the front field over winter, instead of bush hogging as most people do in fall. 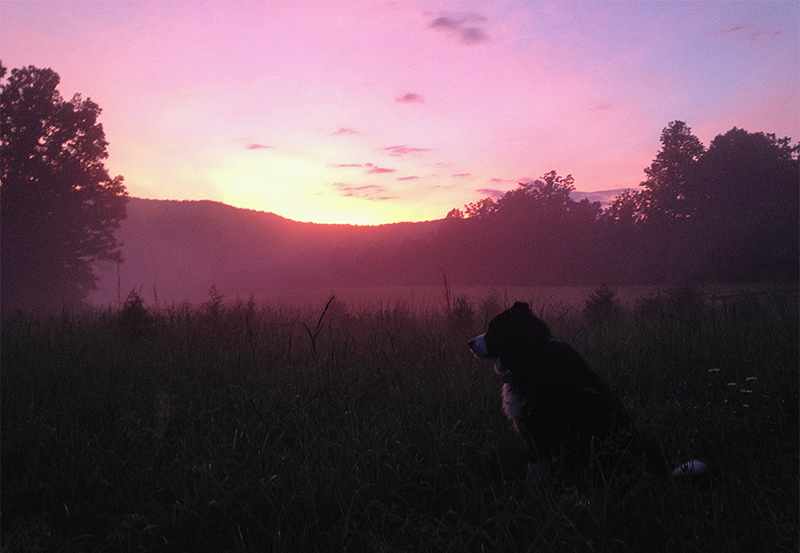 Not only does it create lots of habitat—the place is riddled with deer beds, and Tucker is constantly hunting voles and rabbits out here—it also makes a more interesting picture. And, I love the golden color of the standing grass. In the grey darkness of winter, I will take color anywhere I can get it. Full moon with Chamaecyparis obtusa, in foreground, and Juniperus virginiana, at far right. Cultivated and wild, planted by me and sown by birds, respectively. 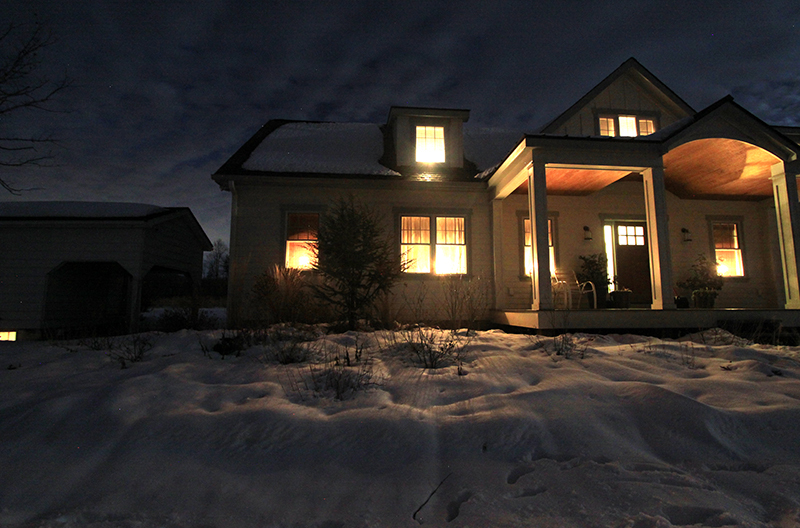 Winter garden, under 15″ of snow. I am loving the architecture of the rock wall beneath the snow, and how something so low and jagged has been smoothed into great pillows lining the bed. There’s another little clipper system on the way, and even in the fifteen or so minutes I was out taking photos the clouds started to thicken and obscure the full moon. We’re supposed to pick up another inch or so of snow overnight, but next week temps are forecast to be in the 60s. Undoubtedly all the daffodils will be tricked into thinking it’s spring, only to be dumped on by the snow that always falls into March. You are currently browsing the Landscape category at Bonafide Farm.